Remember That Time President Obama Shot a Rainbow Out of His Arm? I’ve made a bad habit out of viewing my “On This Day” list curated by Facebook. You know, the list that reminds you of all the stuff you probably shouldn’t have posted on Facebook. Coincidentally, that was the same hipster I was having brunch with. So of course it made sense to show him the post. And, of course, he was offended that I called his dog ugly. Not because I didn’t trust him (priorities). But I figured that after showing it to him, I’d finally never hear from him again. It worked, eventually. 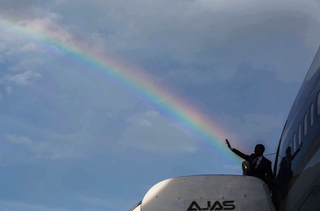 That really has nothing to do with this photo of President Barack Obama shooting a rainbow out of his arm, though. But this photo is one of my absolute favorites that I came across this week. Shoot a rainbow from his arm? Donald Trump could never. But there seems to be a downpour of poo wherever he goes.